Truck-mounted spray pumps are convenient. 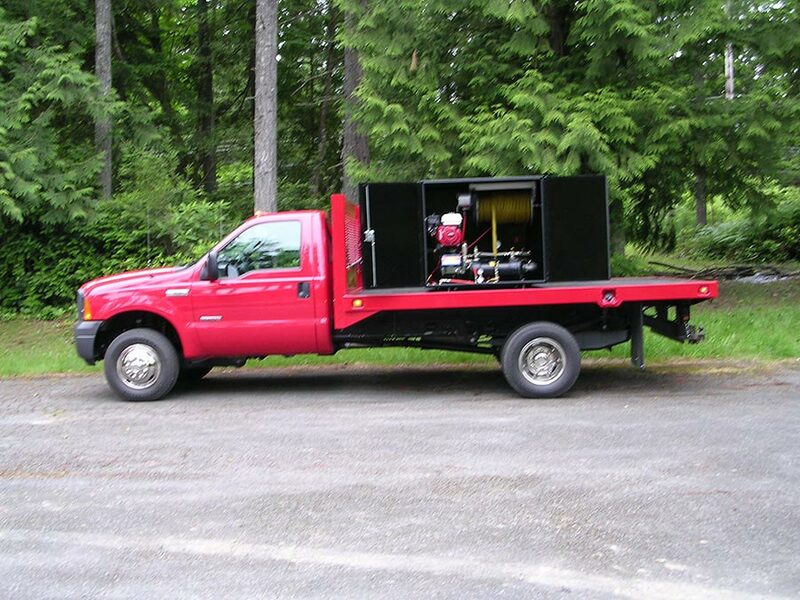 Some units are small enough that the tank, heater, pump, reel and hoses will easily fit in the bed of a standard pickup. The unit is hard-wired into the vehicle’s electrical system, and use the engine’s coolant system to heat the waterproofing material. Every waterproofer needs a spray pump. Whether the business specializes in commercial or residential projects, above-grade or below-grade, it’s probably the most critical—and expensive—piece of equip-ment the company owns. According to Chris Bryntesen at C.J. Spray, a major manufacturer of pumping equipment, the best place to start is to choose the waterproofing product. Still, both admit that a contractor that does a lot of waterproofing will generally have different pumps for different products. 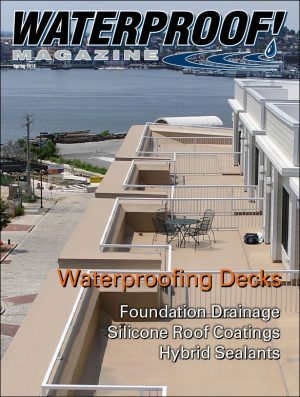 Kuertz points out that real waterproofing is different than dampproofing. Dampproofing stops water vapor from penetrating into the living area of the basement, but it does not stop water under hydrostatic pressure or bridge cracks in a foundation. It must stop water vapor from penetrating to the interior. It must span shrinkage cracks that develop in a foundation wall. It must prevent water under hydrostatic pressure from pene-trating into the basement. Waterproofing materials come in two basic varieties: emulsion-based materials that use water as the carrier agent, and solvent-based materials that use naptha or another solvent as their base. Each has its advantages. Water-based coatings have no solvent fumes, which means less health risks and less personal protective equipment for the applicator. The coating won’t damage plastics or foam, and equipment can be cleaned with water. Perhaps most importantly, water-based coatings can be applied to damp surfaces. 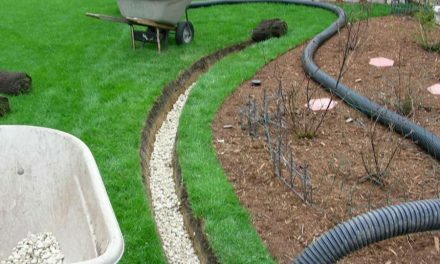 This is a major advantage in situations where rain has fallen, or wet soil has been removed to expose a foundation that needs to be treated. Some units are cabinetized, and have their own engines and heating systems, so contractors can use either a trailer or a flat-bed truck to get them from job to job. The disadvantage, of course, is that it can be washed off if rain falls before it is fully cured. Also, emulsion-based coatings must be protected from freezing temperatures—in storage, transport, and during application. Solvent-based coatings, on the other hand, are not damaged by freezing temperatures, which makes them a popular choice in northern climates. But applicators must wear special protective clothing and respirators, and the coatings can’t be applied to damp surfaces. Solvent-based spray systems have in-tank heaters, insulated hoses, and other components that aren’t necessary for water-based sprayers. Bryntesen, however, cautions that heaters are a good idea regardless of the type of system is used. “A lot of the asphalt-based guys say you can get by without an heater, but you can work a longer season if your equipment has one,” he says. He says water-based materials gets twice as thick every 20 degree (F) drop in temperature. A spray rig will always have a few basic components: a tank, a pump, some sort of heating system, hose, reel, and spray gun. The equipment can either be mounted on a flat-bed truck or a separate trailer, depending on its size and complexity. The Tank: These vary from simple 100-gallon totes to truck-mounted giants holding 500 gallons or more. Emulsion-based systems can sometimes be pumped directly from the drum. Goodman cautions that plastic tanks may not hold up well if the contractor is using a solvent-based material. The Heater: Nearly all heat exchangers use engine coolant as a heat source. Truck-mounted pumps are connected to the engine’s cooling system. 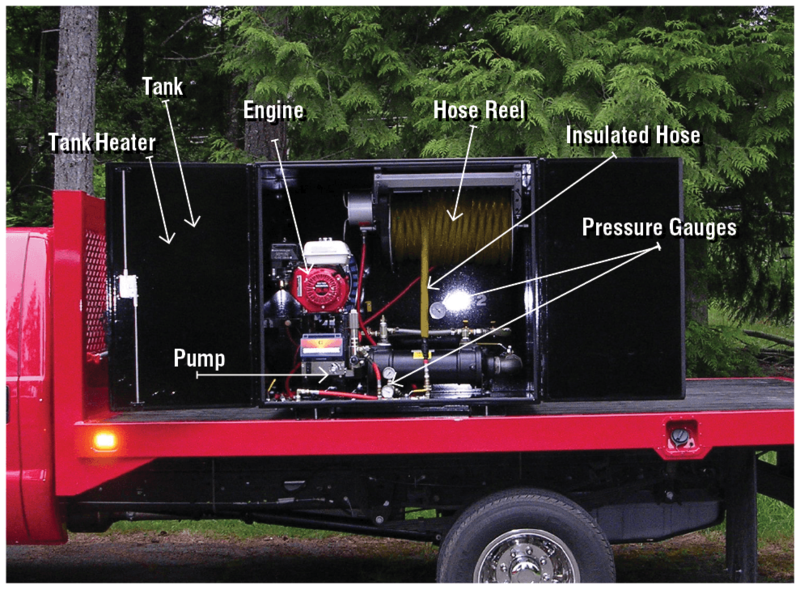 Trailer-mounted spray equipment usually have a separate gas or diesel engine powering the pump, which also provides the heat for the exchanger. The Pump: The pump determines both the pressure in the tank and the product’s rate of application. On small pumps, gas-mechanical devices are used, since they convert the engine’s horsepower into fluid movement most efficiently. Gas-hydraulic systems are also common, and in larger motor sizes—more than about 12 horsepower—they are the only engine-driven system that lasts. Many spray rigs use pneumatic pumps. Bryntesen, at CJ Pump, says pneumatic pumps cost less and typically last longer. They also have the advantage of not producing fumes like gas and diesel engines do. The catch is that the contractor also has to transport an air compressor and hoses on-site in order for the spray rig to work. 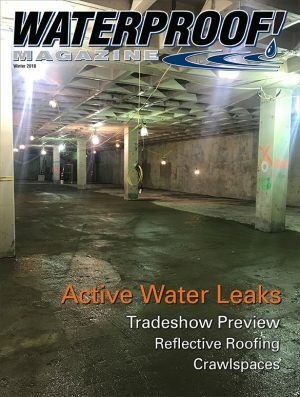 The Hose and Gun: “For ease of use, a foundation waterproofing sprayer should have an electric hose reel,” says Kuertz, at Applied Technologies. 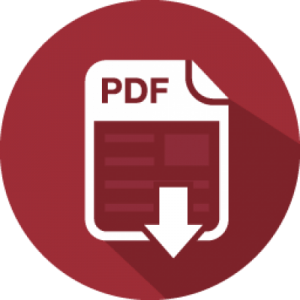 “This will allow a contractor to quickly finish a job and continue to another. Also, the spray hose should be insulated and covered with an abrasion protection sleeve. This will both keep the waterproofing material at the proper spray temperature and protect the hose from damage.” Most rigs come with 150 or 200 feet of hose. The spray gun should match the viscosity and pressure of the fluid, as well as the desired rate of spray. If the contractor chooses an emulsion-based system, the tank needs to be protected from freezing. A number of enclosed trailers and heavy duty van platforms can meet this requirement. “If he already has a flat-bed truck,” Goodman continues, “We offer a heated cabinetized unit that works really well. It has a 150-gallon tank, heat exchanger, heated and jacketed hose, the reel, spray gun, and a Graco GH230 pump.” This combination sprays 2.1 gallons per minute. Applied Technologies offers a truck-mounted unit small and light enough to be transported in a standard half- or three-quarter-ton pick-up. Keep in mind that any truck-mounted spray rig must be tied into the engine coolant system (and electric system as well) so the truck would be dedicated to being a pump truck. It would be committed to that location as long as the waterproofing job lasts. 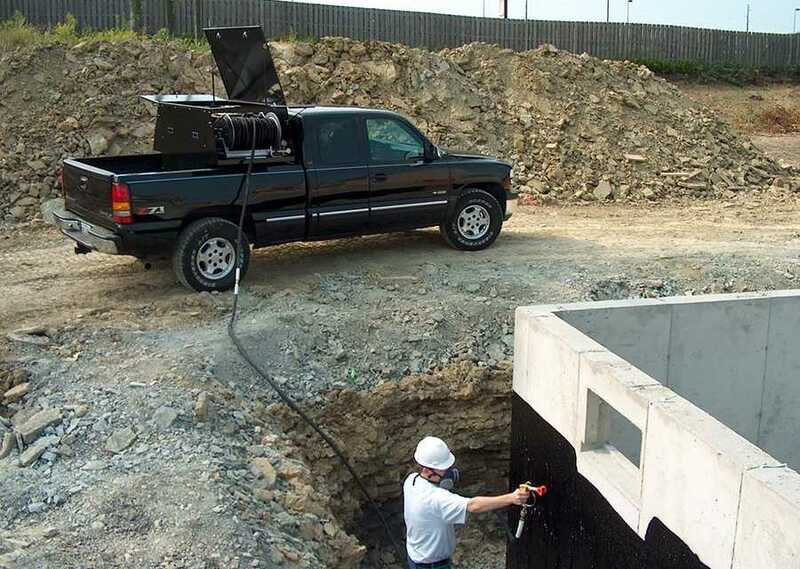 Applied Technologies’ DTS 240 spray rig offers a unique solution to the difficulties of switching waterproofing products. It comes with dual 118-gallon heated tanks, each with its own heat control and on-off switch so the applicator can use one spray unit for two different materials. 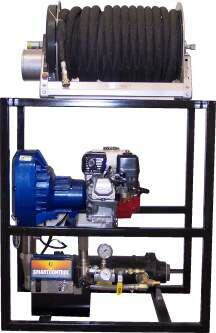 Many pump manufacturers sell components individually, so contractors can configure their own equipment. Bryntesen notes that spray rigs can often be upgraded or reconfigured quite easily. “We can refit or change a tank, add a heater, or even add an additional pump to bottom of the tank for more viscous products,” he says. Goodman and Bryntesen note that many times, pumps really are a one-time investment. “I have Graco pumps out on the lot that have lasted 20 years or more,” Bryntesen says. 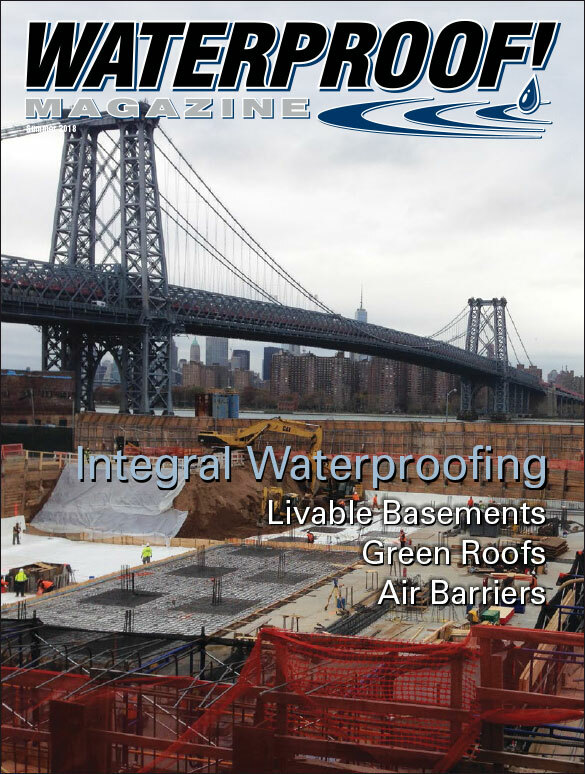 Typically, if a contractor contacts a waterproofing manufacturer and expresses an interest in becoming a waterproofer, the material manufacturer will come out and do a demo, explain their plan, and the profit potential involved. “I don’t know of anyone that rents the equipment,” says Goodman. “The manufacturers want a commitment from the contractor”. 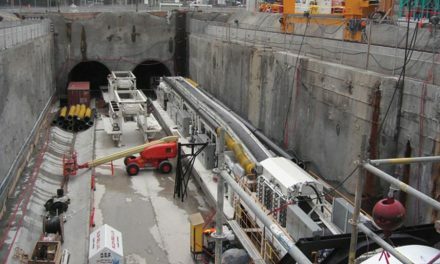 Air barriers, whether fluid-applied, self-adhered, or mechanically-fastened, have become a key component of building design and moisture management. 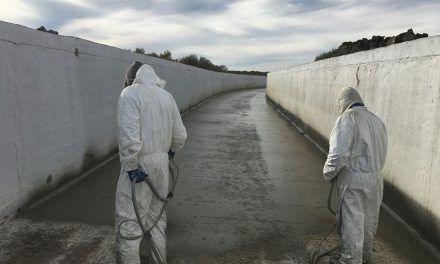 Instead of relying on membranes, these projects used admixtures to make the concrete itself impenetrable to moisture. Planted roofs offer a host of benefits, and are installed on a wide range of commercial projects, including convention centers, apartments, and offices. The right combination of waterproofing, drainage and dehumidification can make below-grade living space just as comfortable and inviting as the above-grade portions.